Idaho Ski Iditarod – your own private Idaho on skis! We skied five of Idaho’s 18 ski areas on our Idaho Iditarod, from rustic alpine area Soldier and Bogus to regal Sun Valley, to the newest – Tamarack. Idaho should be on every skier’s map – but it’s not – and that’s another reason we give a big thumbs up to the potato-growing, powder snow state. We discovered nearly vacant vertical slopes and scenery that goes on for miles. We also found big smiles, the Idahoans are as genuine as the lakes and rivers that grace this mountainous state. Landing in Boise, we were just 16 miles from Bogus Basin, a community owned ski area. There is nothing “Bogus” about the 1,800′ vertical terrain here, you can ski almost 360-degrees from two summits that encompass 2,600-acres with multiple faces, 67 runs and 7 lifts (2 are high speed quads). Bogus’ access road is the real deal too, the twisty turny 45-minute drive up from Boise deserves black diamond status. Our first ski day at Bogus Basin, and after getting our bearings on the Frontside (Bogus’ layout is befuddling), we found steep and deep double black runs off 7,590′ Shafer Butte in the Pine Creek and Superior backside. With its proximity to Boise, Bogus Basin is a good day (and night) area to hit if your flights in and out of Boise allow. Bogus stays open until 10pm, and it bustles on weekends. Driving along the incredibly scenic Payette River, 98 miles north, we arrived in the lakefront town of McCall. This Idaho frontier celebrates the snow season with ice carvings, snowmobiling, and skiing at Brundage Mountain Resort. 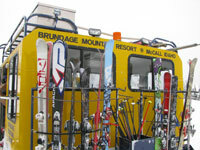 Never heard of Brundage? It may be Idaho’s best kept secret. Brundage gets “the best snow in Idaho” and no crowds. This 1,800′ vertical ski area is a family owned gem, blessed with great natural snow and gorgeous views of Payette Lake and the surrounding Salmon River Mountains, you can even see into Oregon. Brudnage’s Blue Bird Express quad, we lapped seven minute rides to the 7,640′ summit, skiing great cruisers like 45th Parallel and Engen – named after Cory Engen- the Olympic jumper who started Winter Carnivals in McCall in 1924. Brundage’s backside, Lakeview Bowl, offers several well spaced glades and short but sweet runs. Our Brundage day was snowy, often the case in western Idaho, so our views were hindered but our turns were silent and silky. 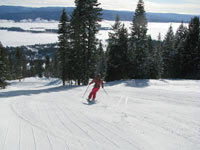 Brundage is an ideal family mountain, reasonable rates, and 1,500 underappreciated acres. I won’t even whisper about Brundage’s backcountry glades and chutes, or tell you about our phenomenal cat skiing day at Brundage where 19,000-acres in Payette National Forest was ours for the poaching, with guides and a private snow cat ride. The Brundage secret will get out soon enough. 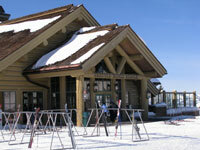 There is no slopeside lodging at Brundage, so we stayed at the Shore Lodge in McCall. This elegant log inspired Lodge (circa 1948) has lake view rooms just steps to the outdoor Jacuzzi, and a short stride to the luxurious fireplace lobby, the mahogany lounge (very popular for après ski), the elegant Narrows Restaurant, an in house Movie Theater, game room, library and the Blue Water Spa. 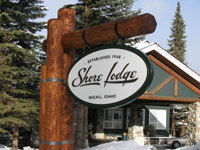 The Shore Lodge sure is nice, skiing is a mere amenity. Skiing North America’s newest resort, Tamarack is just 20 minutes south. 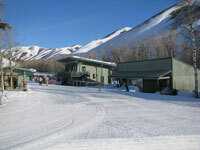 Tamarack opened for skiing in 2004, on 2,100-acres of slopes served by 7 lifts. Tamarack ski area went in fast and first class – high speed lifts canvas an impressive 2,800′ vertical drop of interesting, undulating terrain. Tamarack’s master plan was big and bold at $1.5 billion. Unfortunately, Tamarack couldn’t pay its monster debt, and the resort closed for skiing in March 2009, just after our visit. Tamarack Home Owner Association managed to run a few key lifts each winter by fronting an operating budget, now the resort is being managed by NEWTRAC so things are looking up. We loved Tamarack’s ski terrain (despite its upside down economics), the eastern exposure provides sunshine and spectacular views of Lake Cascade. Sun Valley is as posh as I had pictured, luxurious $8 million timber mountain lodges cater to skiers with leather couches by roaring fireplaces, fine cuisine, and magnificent marble bathrooms. 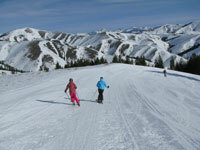 I was surprised at the steepness of Sun Valley (not just the prices). Consistently pitched groomed boulevards on Bald Mountain drop an unrelenting 3,400′ vertical. Seven high speed quads that whisk you back up with stunning Sawtooth Mountain scenery. I imagine the bowl skiing and backcountry on a powder day would be awesome, we had only “Sun Valley sunshine”. The Round House 8-passenger gondola delivers skiers and diners in style to the original 1939 Round House – America’s first on mountain lodge still serves lunch in Alps style with a grand fireplace and accordion accompaniment. Other extravagances include a palatial Nordic and Golf Center and an incredible performing arts Pavilion. The glitzy 1936 Sun Valley Lodge oozes history with photo filled hallways of Olympic skiers and movie stars that came by train. Skaters on the outdoor rink conjure Sonja Henning’s scene from “Sun Valley Serenade,” (which is broadcast endlessly on the hotel TV- I couldn’t watch it enough). The Sun Valley village is dotted with sophisticated ski boutiques, while downtown Ketchum has more diverse dining, western saloons and shops. Sun Valley is rich in history, and in clientele, making it an intriguing place. Skiing legacy is juxtaposed with the latest luxuries, its posh but the slopes are pretty serious. Bringing our Idaho ski odyssey to a finale, we skied Soldier Mountain, circa 1948. Actor Bruce Willis bought this vintage ski area in 1996, but then donated it to a non-profit in 2012 so it remains humble with wide open skiing on 1,150 acres. 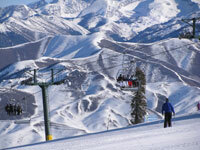 The antitheses of nearby Sun Valley, lift attendants in Carhartt uniforms load two double chairs (1,425′ total vertical). Three dozen runs from 7,177′ Soldier Peak range from surprisingly well groomed cruisers to spacious bowls and glades. 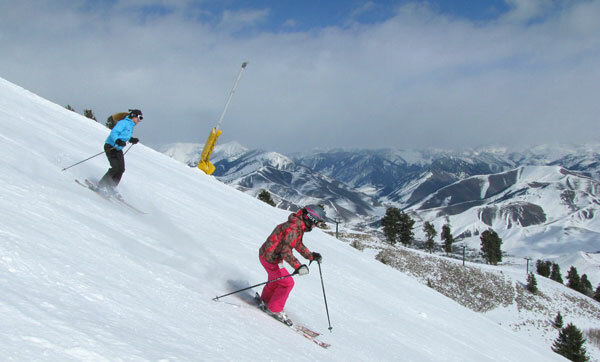 With unlimited powder, Soldier is a must ski on your way to or from Sun Valley. Soldier has a new lodge, the previous one burned to the ground. Other master plan improvements call for four new lifts and additional terrain. For now, if you want to reach the awesome acreage on 10,095′ Smoky Dome, Soldier has Snow Cat Skiing. Idaho’s Soldier, Brundage, and Bogus Basin offer skiing in its essence, really unique rocky mountain skiing with genuine Idaho hominess. Scenery and soft snow are featured, nothing fancier than that. If you want more glitz and white carpet treatment – then Sun Valley and Tamarack (check on Tamarack’s status before you go) provide a more sophisticated ski experience. We love Idaho skiing. Their mountains – like their potatoes, are big and worthy. 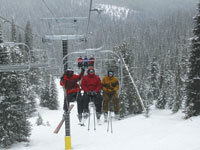 See our northern Idaho skiing reviews of Silver and Schweitzer – Idaho’s largest ski resort.